Excuses are like... well you know. Everyone's got one and they all stink! Especially when it comes to fitness excuses. Everyone would like to be fitter and healthier, and maybe shift a few spare pounds. But the reality is that humans are hardwired to conserve as much time and energy as possible. Of course, this isn’t necessarily a bad thing, and has probably helped our species survive. For example, if a prehistoric man or woman decided they wanted to lose weight, they would have starved themselves to death in a relatively short space of time. But this fact does pose a problem when it comes to motivating yourself to beat off the excuses and get out there and get fit and healthy. Effectively, you’re fighting against evolutionary memory. But we don’t live in caveman times right now. We aren’t hunter-gatherers, and most of us spend a significant amount of time sitting down all day - not to mention the high-calorie foods we eat. So the reality is we have to push ourselves to get up and workout, or we’re going to end up in an unhealthy state. With this in mind, here are some common excuses your body and mind are trying to tell you - and how to defeat them. We get it - life is increasingly hard. But if you feel tired, there are probably a few reasons why. Firstly, it’s your mind fighting against you, which we covered in the intro. But secondly, it’s possibly down to the fact that you aren’t getting enough exercise anyway - or sleep, for that matter. But now let’s say that you do start working out. As Frugal Fitness points out, as you progress, you’ll find you have more energy, get a better night’s sleep, and feel a whole lot better about yourself. As we discussed earlier, the gym isn’t your only option. There is plenty of free advice online, fitness apps, and all kinds of other information you can access for free when it comes to workout tips. And if you can’t afford regular gym payments, just go outside and look around you. A low hanging tree branch could be the perfect pull-up bar. Your local forest gives you a wonderful chance of experiencing nature while you take your morning or evening jog. And you can always go down the Rocky route by chopping logs in your backyard. There are so many fitness activities you can do without spending a dime - just use your imagination! 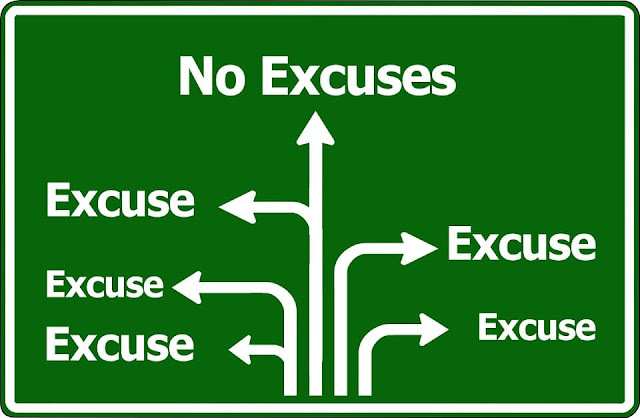 OK, so there you have it - some of the common excuses a lot of people have when it comes to fitness or a business like network marketing. The chances are many of these will resonate with the average person, and whatever level of fitness you are at, it’s likely you will experience them, too. Everyone has these thoughts - it’s how you react to them that counts. Good luck! In all cultures there is tradition. Traditions change over time and in some ways they can lead to highly unhealthy ways of living depending on what they are. People use these times to make excuses. Excuses will kill you. Make a decision to get in better shape and stick with it NO MATTER WHAT. There are so many healthy and delicious foods out there and fun workouts so don't destroy your health and fitness by choosing the wrong path. Be good you. Take care of you. Do what's right for your health. New proven products and business ventures are on the way to help you get healthy and earn money. It's a great life working to help others look and feel their best and performing at a higher level mentally and spiritually. If feeling great and learning to make more money isn't for you then just enjoy the free articles and inspirational messages.